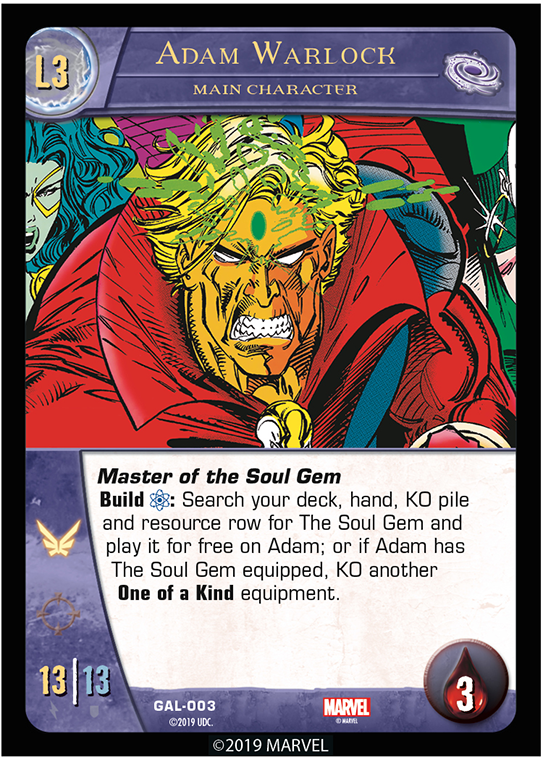 Welcome to our last preview for the Galactic Guardians Issue in the Infinity War Arc for VS. System 2PCG! 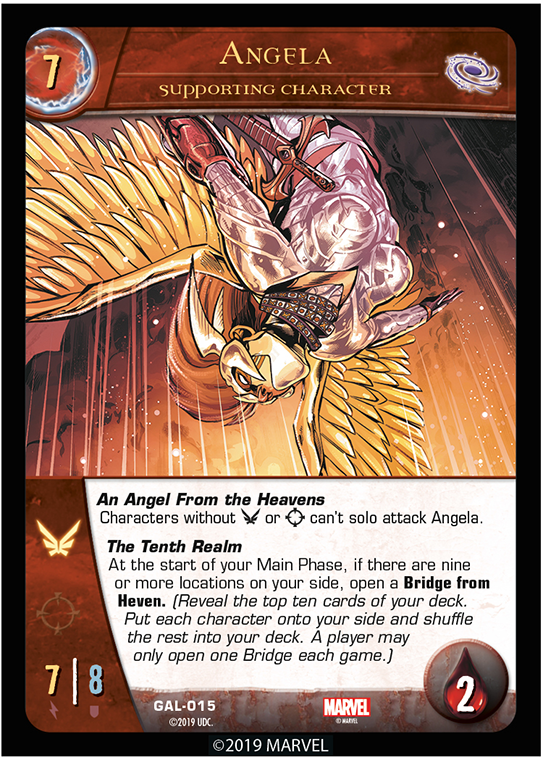 Today we take a look up at the stars, focusing on cards that fly! First up is Aleta Ogord. 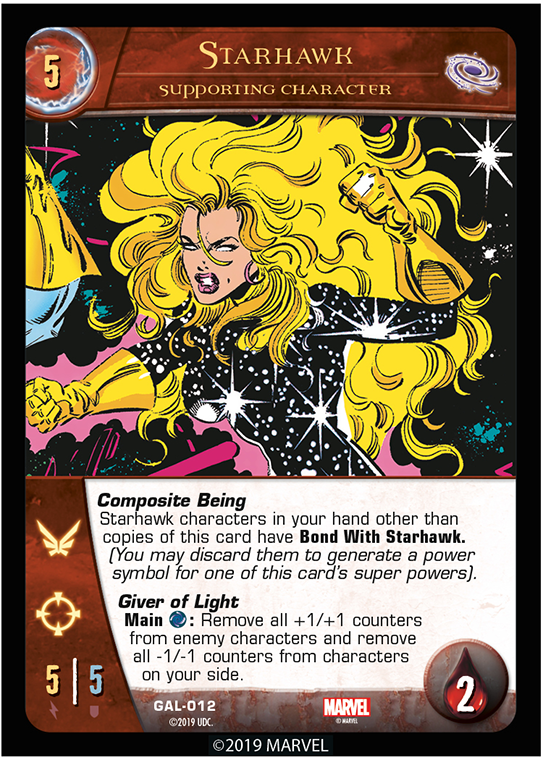 So you can use Starhawk from the Legacy set to power her up (and vice versa), or discard that Legacy Starhawk to use her super power for free! 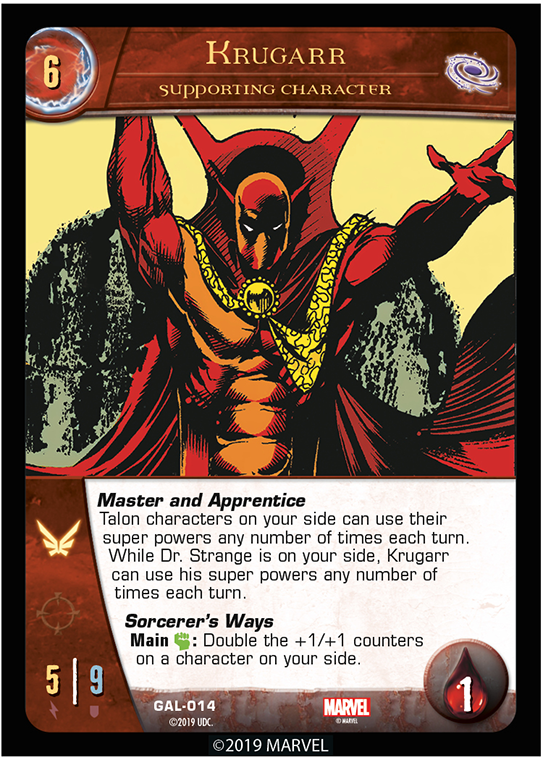 Next we have a lesser-known Sorcerer Supreme, taught by Stephen Strange himself. 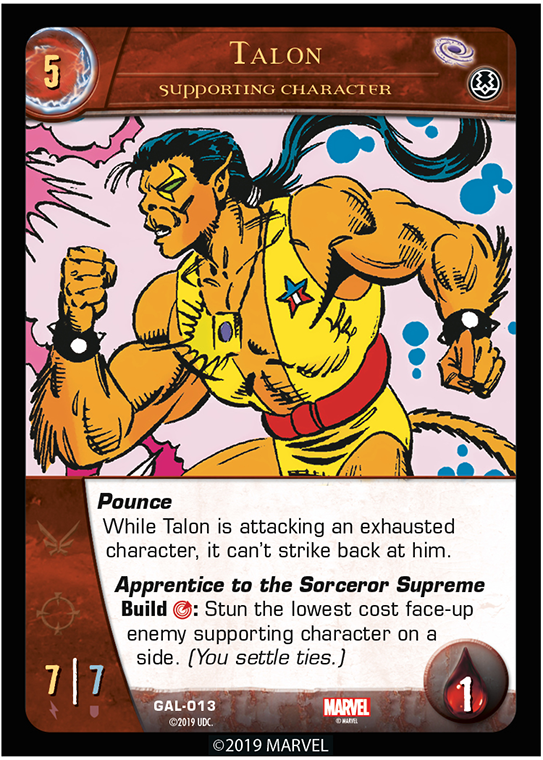 But what, oh what, is a Talon character? Well, here’s someone who’s so fly-y, she’s from literal heaven (Heven, but still)! You read it right. She requires you to ‘discover’ the other nine realms first, but then she can send for help from Heven. 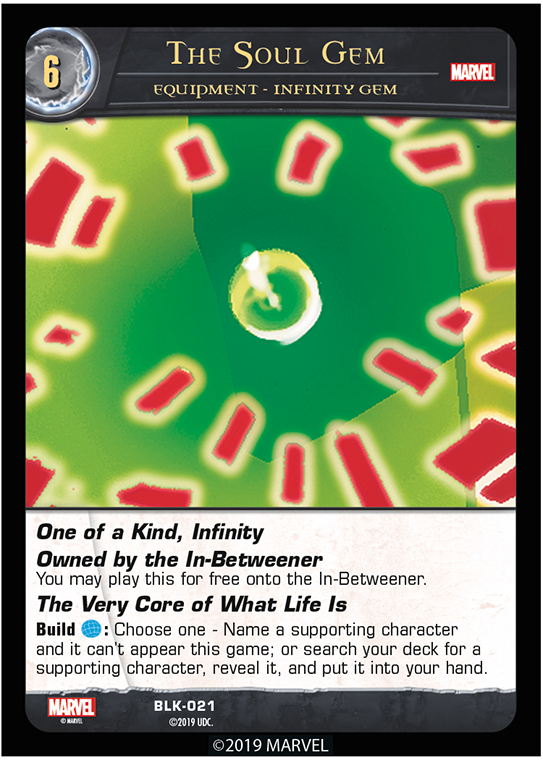 Note that all characters go onto your side (potentially wreaking havoc with uniqueness) except for supporting characters with the same name as a main character on your side (shuffle any of those back into your deck afterwards). Well, enough of characters one at a time. Let’s get a group of space police in here! The powers on them are not super powers. Your main characters must be face up to pay for them. Your main characters can use a “Wild” Special Location from their team to pay for them. 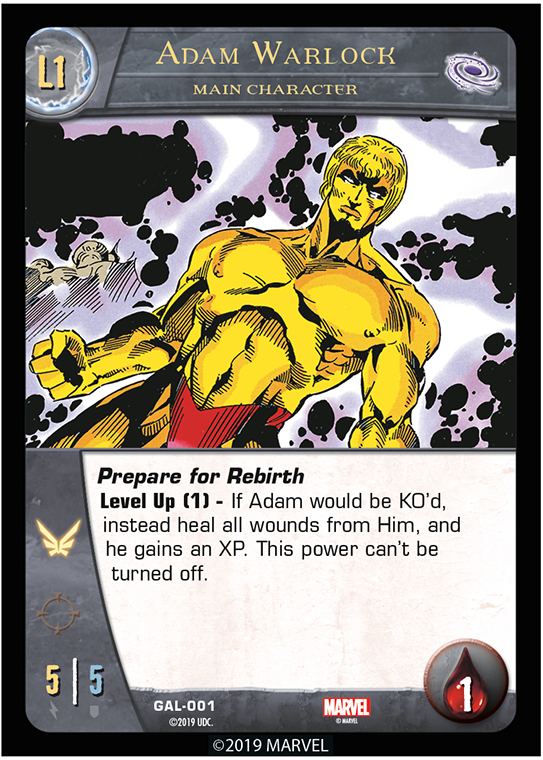 So, at Level 1, if Adam Warlock gets KO’d by getting stunned, Prepare for Rebirth will cause him to gain an XP and become Level 2 while in the stunned position. (If a power like Hex prevents him from leveling up, he’ll remain at Level 1 but will still heal his wounds.) And then he won’t recover normally at Level 2. But eventually he’ll likely be Level 3! But what does the Soul Gem do? 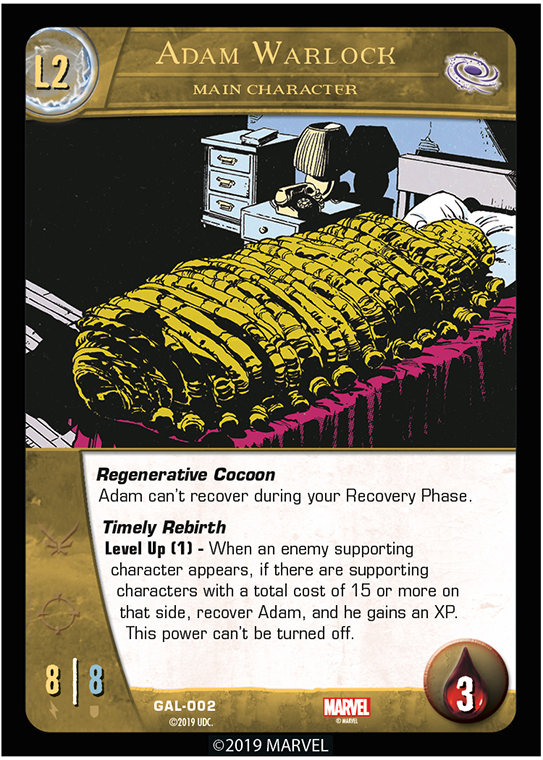 It seems cruel to not have that card previewed here too, doesn’t it? Huh, interesting. 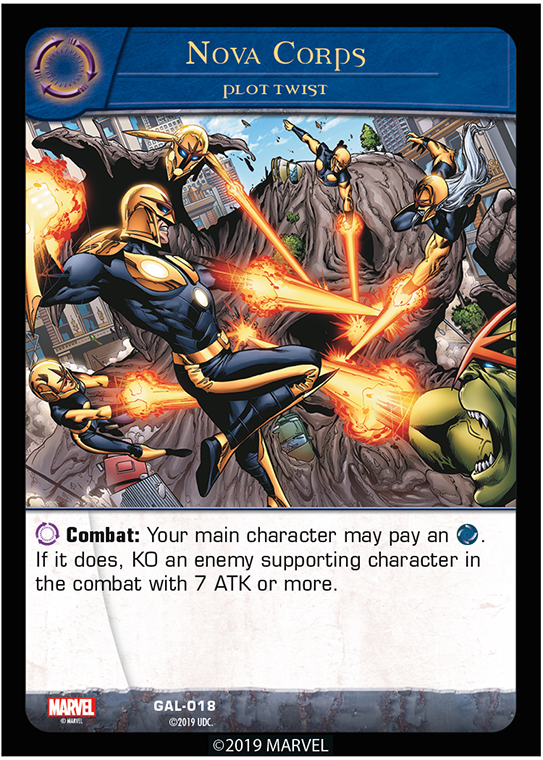 Well, we hope you enjoyed our last look at the Galactic Guardians! Join us next time for our first (well, second) peek at the Black Order Issue!